24hr Emergency Island Contact has been deleted by Homeaway. Call homeaway if you have an on island emergency. Location!!! 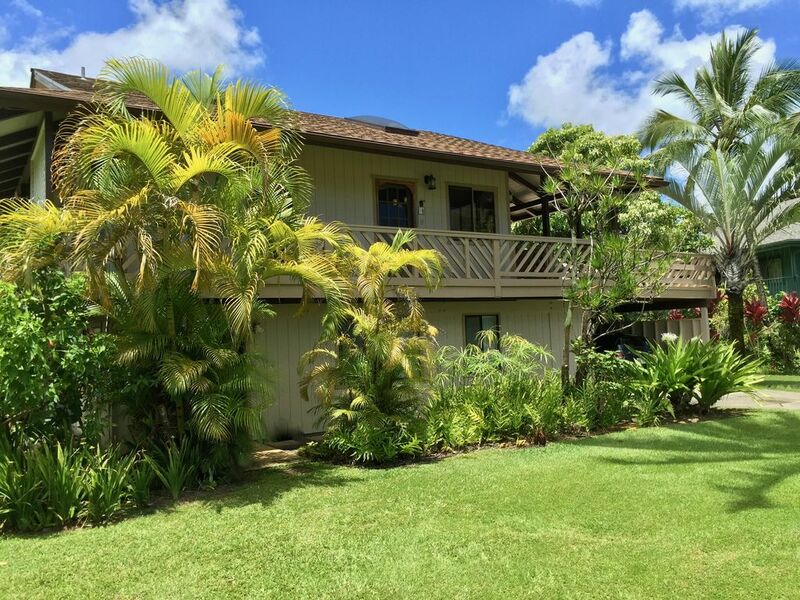 Our home is located in the very quiet, family oriented neighborhood of Hanalei Palms with a 2 minute walk to Beach Pavilion Park with lifeguards.The house features high ceilings & an open floor plan creating a casual, comfortable retreat. The master bedroom has a CA king bed, walk in closet & double vanity. The 2nd bedroom with queen bed has great views of the mountains. The loft has 2 twin beds also with great views!. The kids love the loft. There is a Lanai for outdoor dining and sundeck for relaxing on the lounge chairs, a fully stocked kitchen with all amenities needed great meals. We have free WiFi and a flat screen cable TV with over 100 DVD's. There's a patio for backyard fun, featuring seasonal fruit and tropical flowers & over 40 varieties of Orchids. Beach gear includes: towels, chairs, coolers, umbrellas, boogie boards along with 2 bicycles and a SUP board shared with our other home which is next door & listed under #183242. This is a very quiet and peaceful, lush garden property! Many returnees... You will love it!!! A relaxing property located in a quiet, family oriented neighborhood, beautifully landscaped with fruit trees and a variety of Orchids throughout the grounds. Bocce ball is enjoyed on our expansive lawn. Beautiful views of the mountains and waterfalls can be seen from most bedrooms and backyard. The Ultimate Kauai Handbook along with a small collection of Hardback fiction and nonfiction books with Hawaiian flora and fauna titles. Excelent location, very nice end well equiped house, bedsheets, pillows, towels of excellent quality, tons of beach gear, enjoyable deck with grill, we spent 12 days with family and small kids and all really loved it, we recommend ! Awesome location! Kirsten is great! Another magnificent stay in paradise! We loved our stay in Hanalei and were very sad to leave. Three minute walk to the beach and 5 minute walk to town. We will be back! Perfect. Comfortable, Close, Well-equipped. We want to come back. We had everything we needed (beach chairs, boogie boards, sand toys, umbrellas, coolers, and a cart to haul it all.) The beds were comfortable, the house was clean, well-supplied, perfect for our family of 5. The Movie library was the best I've ever seen in a rental, every classic and family friendly film from the last 20 years ;) The view of Bali Ha'i from the laundry area made even menial chores a blissful experience. We hope to come again! Quiet but central location; lovely mountain views; superbly equipped, great lanai in the trees. If you can’t be right in the beach, you should be here. Until confirmed, rates subject to change. Please have airline tickets purchased before inquiring. Please read our attached contract, sign and attach to your reservation. Credit card transaction fee is due to Expedia policy of mandatory payment through their processing vendor.